As a reputable company, ABC Roofing & Siding is very familiar with the insurance claim process. We work directly with the insurance company on your behalf. Our goal is to ensure a best possible outcome for your insurance claim. Furthermore, we will guide through the entire claim process. You will be kept well informed. Also, your questions and concerns will be promptly addressed. First, before embarking on an insurance claim, it’s a good idea to check your policy. Ideally, you want to make sure you have adequate coverage. Most homeowner policies have replacement cost value coverage. This is the best type of policy. It covers the full cost of replacing whatever has been damaged. However, there are some restrictive policies out there – such as actual cash value coverage. This policy only covers the present value of the damaged materials. For example, if you have a ten year old roof – they would pay to replace the roof minus 10 years of wear. When checking your policy, confirm the amount of your deductible. Your deductible is an out-of-pocket expense you pay directly to the contractor. If you have questions about your policy, contact your insurance agents office. Also, you can call us at 630-566-2909 – or go to our Contact Us page. First, you can contact the claim center of your insurance company. This is the way most people open a claim – by phone or online. Second, your insurance agents office can assist you. Although, they will often refer you back to the claim center. Third, one of our representatives help you open the claim. Opening a claim is a pretty straight forward process. 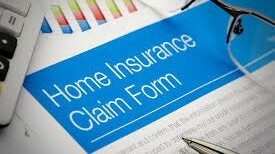 To begin, the claim center will need to confirm you are the policy holder. Next, they’ll ask you some basic questions about the damage. They’ll need to know the type of damage, what got damaged, and the date and time it occurred. When done, a claim number will be assigned. The claim is now opened. Next, your insurance company will need to validate the damage. Accordingly, they will send a claims adjuster to inspect your property for the damage. At the same time, our representative will meet with the aduster. Together, the damage is professionally reviewed. That way, nothing gets missed or over-looked. The adjuster will determine the extent of the damage. Then, decide if coverage is warranted. Most often, damages are approved for full coverage. However, there are times when coverage is denied or only partially approved. As needed, our representative will be there to address this issue. The adjuster review is the most important part of the insurance claim process. Having an experienced professional there with the adjuster is most beneficial. Once damages are approved, the adjuster will create a written estimate for the repairs. Typically, this is done shortly after the inspection. Also, the adjuster will issue a check for partial payment. It is rare for full payment to be issued up front. Your insurance company wants to make sure the work gets done. So, they deliberately hold back money as an incentive. If the work is never completed, they will keep the witheld amount. Also, you will loose future coverage. As you can see, it’s important to follow-thru and have the work completed. Afterwards, they will make the remaining payment. By law, the insurance company is required to settle a claim at a fair price. Ideally, their estimate will cover all necessary costs. As your contractor, we perform the work per their estimate. However, if the estimate is inadequte in some way, we will reconcile with them. Part of our job is to make sure everything is properly covered and paid. As necessary, the original estimate will be supplemented with additional proceeds. Your insurance policy gives you a certain length of time to have the repairs completed. This can vary from one insurance company to another. However, it’s important that repairs be completed reasonably soon. That way, no further damage will occur to what’s already been compromised. ABC Roofing & Siding will arrange and perform the work in a timely fashion. Beforehand, we’ll go over new material and color choices with you. Moreover, we want to make sure you are comfortable with the construction process. In addition, we will take care of procuring the permit. Our installers are professional and proficient in performing the work. We always take steps to minimize the amount of disturbance. Ordinarily, most of our roof replacement jobs are completed in one day. Insurance companies are large organizations. As such, the amount of information and paperwork they generate can be impressive. Remember, we work on your behalf and deal directly with your insurance company. Accordingly, we will handle all necessary paperwork and documentation they require. Also, we will deal with any paperwork your mortgage company may require. Afterwards, our office will follow-up with the insurance company. We will invoice them to release the final payment. Then, once we receive final payment, the insurance claim process is now complete. Check out what satisfied customers have to say about ABC Roofing & Siding at HomeAdvisor.